Once thought extinct, Elephant Seals have made a resounding comeback. Go to the scene of some real wildlife excitement. Hearst would have loved it, right there in his front yard! Yet seems forbidding, distant, and haunting. The fearless, intrepid Spaniards called it “The great country to the South” – and they were leery of venturing there. These lands remain elusive to most Caucasians, but to Indians this was a pleasing place. Before a white person ever saw Big Sur, a large population of Indians lived here peacefully and prosperously for thousands of years. Salinan, Esselen, and Ohlone-Rumsen artifacts show Big Sur habitation for 10,000 years. Big Sur began 35 million years ago, 14 miles deep in the earth off the coast of Mexico. Tectonic plates rubbing against each other moved these mountainous rocks north. Five million years ago they pushed up out of the ocean to form an island that is now Big Sur. 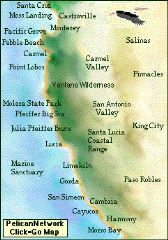 The Santa Lucia range, which includes the Ventana Wilderness of today, is young and precocioous. Today, Big Sur is a coastal wilderness. It is as raw as could be imagined for its 200,000 acres and 90 miles of California coast. It is a grand testimony to the human craving for appreciating this undeveloped, natural beauty that it has been protected. A highway was constructed in the 1930’s just to see this boldly beautiful natural setting. The road in this setting has come to define Big Sur for most people. But, the will of the pioneers to conserve the remarkable region has prevented its destruction by development. Ninety-five per cent of Big Sur is the fold-upon-fold of Ventana Wilderness, rare biology, incredible geology that most people do not ever see. In the coastal mountain canyons that vein the intricate quilt of watersheds (e.g. a hike in Partington) one gets an inside peek at this wondrous country. In these pages you will come to know it, want to appreciate it and help conserve it. Big Sur Coast from high up Partington Canyon. Around a bend in the Big Sur road, about seven miles south of Nepenthe, the McWay waterfall suddenly appears. In mid-formation is Saddle Rock, an object of wonder for Big Sur pioneers. Julia Pfeiffer Burns State Park begins here. Julia was a pioneer, and the park was named after her by Helen and Lathrop Brown. Lathrop was a congressman from New York, and became a high ranking official in the U.S. Dept. of Interior. Helen was the daughter of a wealthy banking family. Together they built resorts on the Eastern Seaboard. They researched to find what would be the perfect seaside location on the Pacific Ocean side of the continent. After coming to Big Sur, they found McWay Cove, bought it, and built the Waterfall House. They so admired their caretaker, Julia Pfeiffer Burns, the Browns bequeathed the land to California for a park. Called “Saddle Rock Ranch” by the Browns, the property reaches north to Partington Cove, and east to the ridge where they built the Tin House. McWay Falls used to drop directly into the ocean. In 1983, however, the California Department of Transportation, while repairing Hwy 1 from landslide damage, bulldozed earth into the ocean, creating more beaches. The cliffs are rugged, and the cove cannot be reached by foot. These waters offer spectacular scuba diving, but only with a permit. 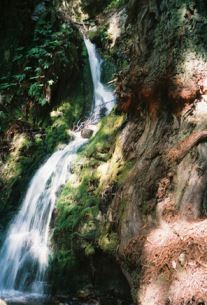 The waterfall can be approached by trail from the park. There’s an exquisite picnic area in the redwood grove along the creek, and trails up to the ridge overlook the coast. Next to the falls are two hike-in campsites. The “state of mind,” that is this region, is geographically 90 miles long and 20 miles wide. Much of the best to see requires more than driving along the coast. Partington Canyon, and its stunning forests, including ancient growth redwoods, are close to the highway, but must be hiked to. To experience the rarefied atmosphere of a Big Sur mountain coastal canyon, take a hike in Partington. Ventana region of the California Central Coast. People who loved the area feared the worst. road, and that would bring ruin to the region. As befits the character of the people who inhabit this region, like those in Carmel before them, the people rose to thwart back the specter. Big Sur River runs free and wild out of the Santa Lucia Mountains through Big Sur Valley and meets the sea in a lagoon at Molera Point. The village of Big Sur is demurely strung along the Redwood-lined road in the Big Sur Valley south of Molera. This view from the back shows the geological significance of spanning the canyon. Before the bridge, this was considered the beginning of Big Sur. Hardly anyone went beyond this point. A ten mile inland road accessed the lower reaches of the coast. In the bottom of this canyon, which was called Rainbow then, there was a resort owned by the family that rediscovered the Sea Otters in 1938. Bixby once was a busy place. By 1910 there were a dozen limekilns operating in the canyon. Kerouac’s last novel, Big Sur, the telling of man’s ferocious relationship with nature, was written from three trips to this canyon. He thought the creek, canyon and beach here made him insane. Ending Big Sur’s isolation in 1932, the 714 ft long Bixby Bridge made the Carmel – San Simeon road an accomplishment for the ages. It is constructed of 6,600 cubic yards of concrete and 600,000 pounds of reinforcing steel – and straight up, 260 feet above the creek. The concrete abutments, anchored into sheer rock walls 140 feet above the creek, are 330 feet apart. Its graceful arch bows over the creek in the scrubby canyon that rises abruptly on both sides from the sea. It is one of the highest single-span arch bridges in the world. They appear supple, hospitable. But they’re rough. Although only one-third the altitude of the Sierra Nevada mountains, the Santa Lucias have more dramatic altitude changes. Five-thousand footpeaks plunge to the sea. You can hike through redwood canyons to heights above 2,000 feet in just two to three hours, and feel like your are be practically right on top of the Pacific. Unique lodges and inns of Big Sur and Places keep in character with their distinctive settings. This carved Phoenix at Nepenthe watches over the rough, classic watersheds, coves and the infinite Big Sur Coast to the south. Two great lighthouses mark the Big Sur coast. Big Sur, Story of A Coastal Wilderness, is copyrighted by ©Pelican Network. Permission to use portions of this content is freely given with the single proviso that it is used to advance understanding of cultural and natural history. All photographs, unless credited, and narrative are by Jack Ellwanger, editor, Pelican Network. Popular Pfeiffer Beach (left) is fabled, fantastic and fun. Reserve a Big Sur Lodge cottage at Pfeiffer Big Sur State Park online with Pelican Network.